• Breath of Fresh Air scrapkit available at Nitwits. However, you can easily use a FTU kit if you wish not to puchase the kit. • Tube I used was by Myka Jelina and is available for purchase with license through CILM, but any tube will do also. • Font used was Parsley script. 3. Take frame scallop (black and blue circular one) if you are using the same kit I did. Re-size as needed to fit your canvas. Using your magic wand tool, click inside the frame (be sure to get all of the inner parts) and expand by about 5, invert your selection. 4. Paste whatever paper you wish to use in a layer below your frame, I used bg_bluedots paper for this tag. Press delete to remove the excess. Select none. At this point, on the frame scallop layer I gave it a little bit of a drop shadow, just enough to make it pop out a little. 5. Now we want a background for under the frame. Choose whatever paper you wish, I used bg_striped. On the layer above (the circle for inside the frame), select all, float, defloat, invert selection, then paste the paper as a new layer below that circle, then press delete to remove the excess paper and then select none. Resize this layer by about 111%, we want it a little bigger than the frame for the effects we are going to do to show up. I then grabbed my deform tool to make it peek behind just a wee bit more, but that is just a preference. This effect gives just a little bit of a blurred zoomed effect in the background. 7. Now we want to add the tube to this beauty. Position and re-sized your tube to your liking. I sharpened the tube and then applied the Xero Porcelain filter. This just gives the filter a pretty glow. Give a slight drop shadow to the tube. 9. If you like, add some wordart, I used the Sparkle wordart piece from the kit. I didn't like how it didn't really pop off the screen though so I added a gradient glow to the wordart, just a simple of 3, 0, 100 and on the second screen, I used black, but whichever setting you prefer. 12. Now it's time to add your text, I chose to use Parsley script size 90 on this one. I chose a color from my tube's shoe, #4caed7. Then I applied Super Blade Pro Glass (coconut ice) setting, followed by Eye Candy 4000 Gradient Glow setting. My setting I used as just the 'Fat" setting. On the first panel, it's 3, 0, 100 and on the second panel, just choose your color, and for this tag, I chose Black. Apply a drop shadow of your choice. I like mine to be subtle, so I used 0, 0, 65, 8 and #4caed7. 13. Save as a png file and that's it voila! I hope you found this very easy to do and I didn't confuse you too much along the way. If you would like to show me your results, I'd sure love it! Click HERE to get to the Show Off Thread for this tut. 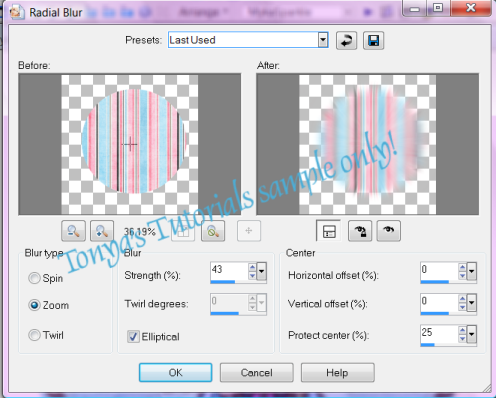 This tutorial was written by Tonya on September 22, 2008 and absolutely no part of this tutorial may be taken or used without my expression permission.